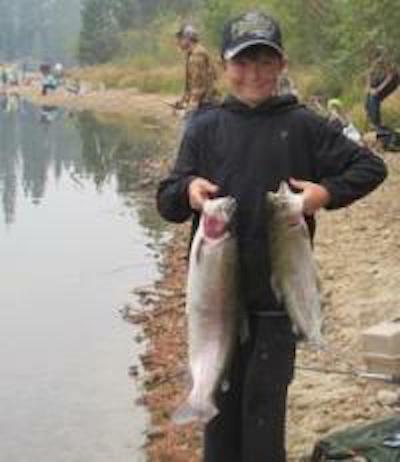 Hundreds of pounds of trout will be stocked in Lake Baron for the 16th annual Kids' Fishing Derby hosted by the Moose Lodge of South Lake Tahoe on Sunday, September 16.
children. The event wraps up at 2:00 p.m.
For the event, the Lodge will be planting the Lake with hundreds of pounds of catchable trout ranging from one to five pounds. Fishing poles, tackle, and bait are provided or kids can bring their own. Savings bonds will be awarded to the 1st, 2nd and 3rd place finishers at 2:30 p.m. for the three largest fish caught. Each registered child also will receive a raffle ticket for a drawing to win a prize from a large selection of toys and games. The Moose Lodge would like to thank the following sponsors: Tahoe Paradise Park, Holiday Market, EDC Fish and Game Committee, McKinney and Associates, South Lake Tahoe Kiwanis Club, Tahoe Fly Fishing Outfitters, Kiwanis Club of Tahoe Sierra, Signs of Tahoe, IBEW Local Union 1245, Roadrunner Gas - Meyers, El Dorado Savings Bank and Chevron Gas - Meyers. Lake Baron at Tahoe Paradise Park is located at 1011 East San Bernardino Avenue in Meyers. For more information, call (530) 545-1834. After 2:00 p.m., the Lake is open to the community for barbless “Catch and Release" fishing only.